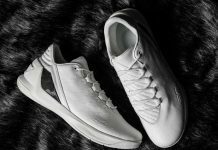 Under Armour celebrates the University of South Carolina reaching the Final Four to become the first ever UA school to ever go that far in the tournament with a special edition UA Curry 3 Lux Oxblood Leather release. This is an exclusive Under Armour Curry Lux release that features premium Oxblood leather and perforated upper with soft leather lining and insole, quilted heel panel, waxed laces atop a Sail rubber sole. You can now find the UA Curry 3 Lux “Oxblood Leather” available today directly on UA.com. The retail price tag is set at $150 USD.